When six private and public partners came together to form the Redding Cultural District, we had no idea what was coming. A city of 90,000, framed by scenic views of the Cascade foothills, the Sacramento River, Mount Shasta, and Mount Lassen — and home to the famous Sundial Bridge — is now in the midst of a full-fledged revitalization of its downtown area, spurred largely by the new state designation. What was once a relatively sleepy region has awakened with a new sense of purpose. Projects abound: Four stories of retail and residential space are in development. Streets lost decades ago to poorly planned construction will be reemerging and given new life. Plans for a new greenspace — sorely lacking in downtown Redding — are on the horizon. Even an effort to save a historic building — led by This Place Matters, an initiative of Redding and the Shasta County Arts Council — plays its part in building an infrastructure for bicycle transit downtown. But the boon from Redding’s downtown designation is about so much more than development. It’s about reimagination. During the re-write of Redding’s Downtown Specific Plan, we were urged by members of our Cultural District committee to petition the city to consider changing the opening paragraph of the plan. It talked about the history of Redding and how it started in 1872. Suffice to say, it lacked today’s lens of cultural awareness, recognition of indigenous inhabitants, and the truth of their experience. 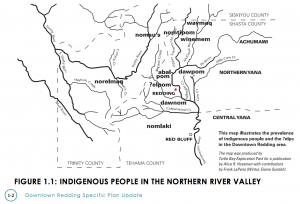 Today, the Downtown Specific Plan’s history section reads like this: “Nine bands of northern Wintu people have resided within the area of the Northern River Valley and surrounding mountains from time immemorial, living with the abundant landscape.” It recounts the violence, devastation, and betrayal they experienced. We also included a map to illustrate the prevalence of the indigenous people in the downtown region — particularly the ?elpom. Wintu descendents still reside in the area today and are represented on our committee. The process has led to an upcoming presentation by Wintu native Kenwa Kravitz to the Redding City Council of a book on her people’s history. This is a first step toward honoring Redding’s indigenous roots. In November of last year, the Redding Cultural District held a meeting including five additional California Cultural District designees and members of the Redding community, to determine future activities for our various movements. Key topics of discussion included unification, low-cost artist housing, community-based events, youth programs, cultural inclusion, and the creation of interactive public art. Shasta County Arts Council also leveraged Redding’s the cultural district designation into a $242,000 grant from The McConnell Foundation to help fulfill the goals of our original plan. We created a mini-grant program to spur creative use of space and activating under-utilized spaces. And funds are being put toward environmental signage, advertising, videos and digital material as well as for the creation of our website — ReddingCulturalDistrict.org — and more. Shasta County Arts Council, the lead agency for the Redding Cultural District, awarded 19 mini-grants totaling $50,000. The projects run the gamut, from subsidizing a Redding Chamber of Commerce event featuring a musical group from Austin, Texas; to Shakespeare in the Park — designed to activate and reclaim an underutilized amphitheater on the Sacramento River; to a selfie pop-up booth in the downtown construction zone; and the creation of an original song about Redding (we’ll keep you posted). We also funded an LGBTQ art festival, a fashion week, a children’s theater production, a night of environmental creativity, silent films, an indigenous salmon mural, an original webisode showcasing iconic images of the city, and then some. We’re elated to see these projects come to life throughout the rest of this year and into 2019. The mini-grant process gave way to an unanticipated collaboration between the district and the recipient organizations: We have helped navigate the rules and regulations surrounding public performances or the use of city space; we’re helping to create public art guidelines for murals and help facilitating public-private partnerships on a variety of levels. We’re connecting these folks to the larger art community. One grant recipient is now working with a local theater group to produce and direct plays. 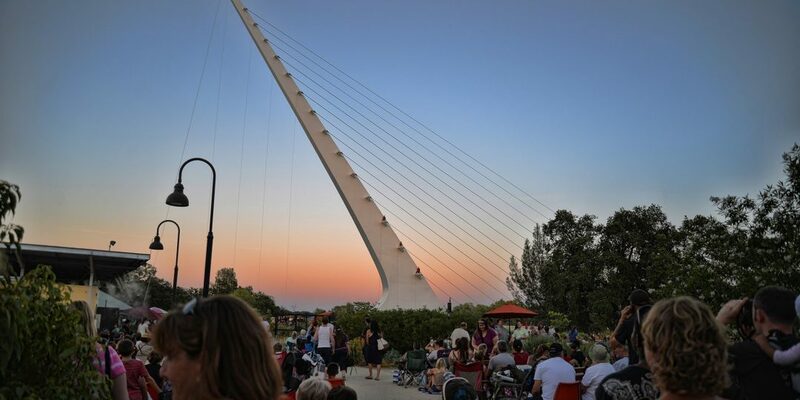 We’ve become a facilitator of dreams in our new Redding Cultural District. You don’t have to look far or long to find something about Shasta Dam in Redding. Built in the late 1930s, Shasta Dam generates hydroelectric power and at 602 feet high, is the ninth-tallest dam in the United States. It forms the largest reservoir in California. We have a burger joint that’s been in Downtown for 70 years — appropriately called Damburger. Now, in honor of the annual May Rodeo (we have the Redding Rodeo grounds front and center in our district), we installed a pop-up art project called #damartalley or #artalleyredding. It’s an interactive mural. You’ll have to visit to check it out. Our California Cultural District has been a catalyst for new ideas, new activities and new partnerships. It’s a good thing for Redding and for the State of California. Many thanks to the California Arts Council for facilitating this dynamic program — one that highlights arts and culture as true economic development. Debra Lucero is Executive Director of the Shasta County Arts Council. 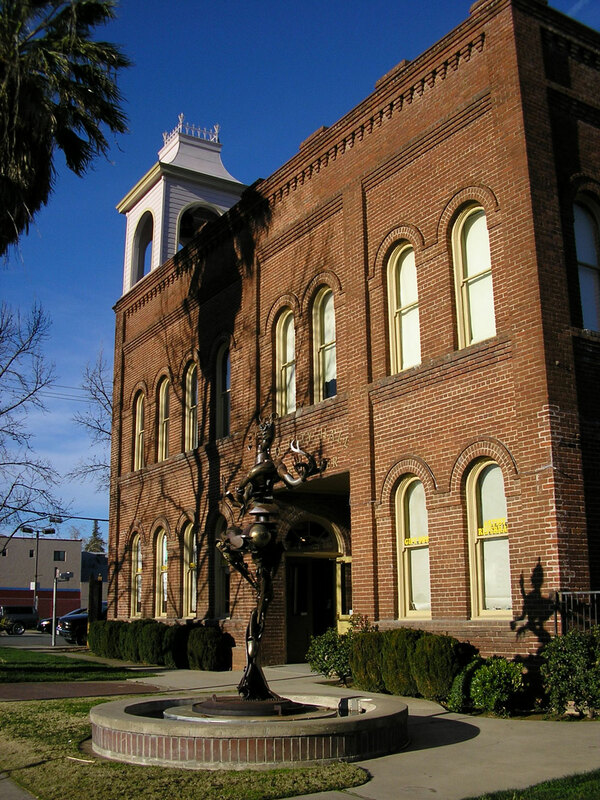 To learn more about the Redding Cultural District and the California Cultural District program, www.caculturaldistricts.org.